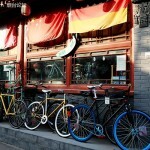 Natooke bike shop is situated in Wudaoying Hutong, an up and coming Beijing style alley, right beside the famous Lama Temple. 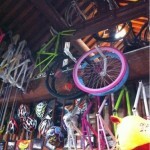 The shop mainly sells custom made single speed and fixed gear bikes with an unbelievable variety of colored bike components as well as accessories including anti-pollution masks. A second Natooke store has been opened in Chengdu. The German founder of Natooke, Ines Brunn, is famous among cyclists worldwide. 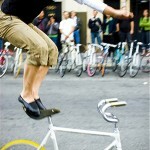 Ines has a long history over 20 years in cycling and performing tricks on her fixed gear bicycle all over the world. 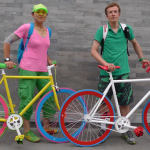 In 2009 she opened her shop in Beijing, based on the idea to inspire more people to ride a bike in cities. Ines wants to promote environmentally friendly lifestyle to help our cities become more livable. 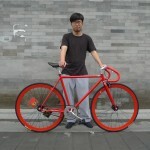 It is great to see an ever increasing number of Natooke bikes color up Beijing and other Chinese cities. 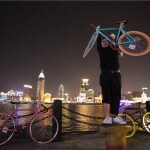 Natooke was the first fixed gear bike shop in China. 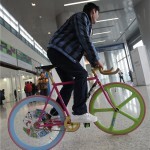 The concept is custom built bikes to suit the style of any customer. 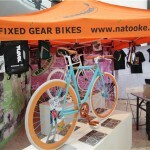 At the shop customers can choose each part in their favorite colors and then Natooke builds up each bike from scratch. 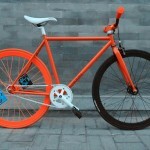 The company is also the China distributor for foreign high quality urban cycling and accessory brands. The company has been the exclusive China distributor for the Respro anti-pollution masks from UK for over 5 years.